Ever wrestle with feeling guilty about something you do as a mom, and not really being sure if you’re making the right decision? Here is the thing I’ve been thinking about: Is it true that if I pick up something that my children left out without correcting them or handing out “consequences,” then I’m teaching them to be irresponsible? Truthfully, I regularly pick up after my children. That’s to save my sanity. Children clean slowly, they get distracted, and they don’t always do the job well. If I always made them clean up everything they left out, I either would get nothing else done during the day, or we would have constant tears from overwhelmed children who still can make a mess faster and bigger than they are able to clean up. 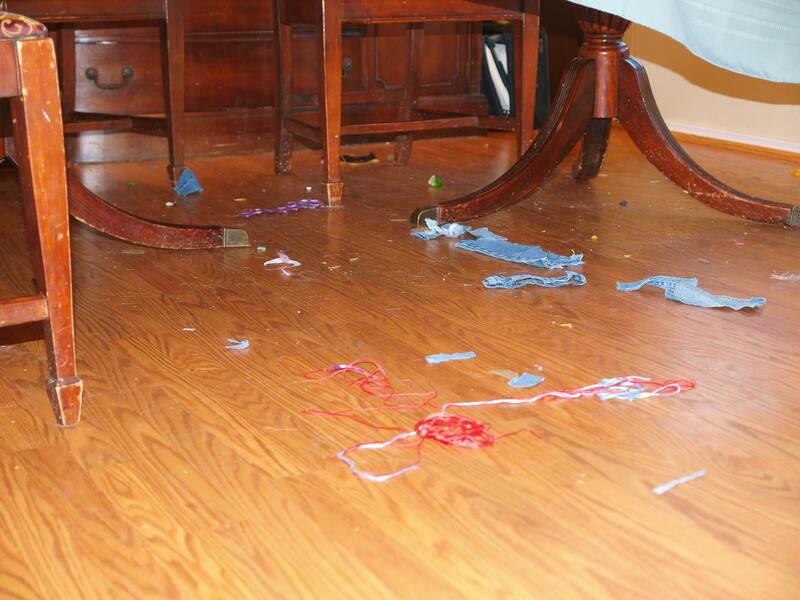 If I do nothing, the house quickly degenerates into a mess that’s overwhelming for me! Then I wonder, to verbally correct or not? Sure I can clean up after them, but it’s important that they are corrected, right? But if I do that, then again I overwhelm them with a constant stream of corrections. What’s a mom to do? Tomorrow, I’ll tell the story of my messy floor. In the meantime, I’m asking myself this question: What biblical principles will dictate 1) whether I clean up their mess and 2) whether I correct them or offer consequences when I do clean up after them? I am (as always) interested to read your answer. I struggle with making my kids clean up because I am not disciplined and am often too busy to do the job well myself. It seems with the multiple responsibilities being juggled around here, cleaning is the easiest to let go, but I am not sure that is wise sometimes. A messy house increases the stress level of all of its occupants I am finding. I think I need to look internally before I demand too much of them externally. Yes, I do agree that messy house increases stress. Are you thinking looking internally at your children’s motives, or your own heart? I am learning that having the children helping with chores means that more gets done, even if the windows are streaked from cleaning, instead of smudged with fingerprints. And their sweeping is always better than no sweeping. Helping children mature in this area takes up a lot of thought power– but I do think that as I grow, I’m better able to help my children grow.